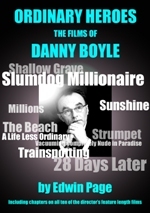 With chapters dedicated to each of the ten films Danny Boyle has directed, this book explores the themes, techniques and style of the director's work. From Shallow Grave to the Oscar winning Slumdog Millionaire - and including the hit movies Trainspotting, The Beach and 28 Days Later - Boyle's influence is examined and assessed. The use of quotes from the director, along with various cast and crew members, creates additional depth to this compelling journey through the films of one of the best British directors working in contemporary cinema today. Edwin Page has a 1st Class Degree in Film and Literary Studies. He has previously had books published on the work of directors Quentin Tarantino and Tim Burton. Mr Page is also a novelist, photographer and short film maker, and lives with his wife in Cornwall, England. The slumdog's b*ll*cks of a book. A must have for any movie lover. Ordinary Heroes presents a detailed analysis into the common themes and technical style that Danny Boyle has brought to his films, both from a narrative and stylistic perspective. The author's biography highlights a background in academic film studies, and this shows clearly from the sharp insight that Edwin brings to the text, presenting a fascinating look into one of Britain's most diverse talents. A must read for anyone who has enjoyed Danny's films, from the amazing Shallow Grave through to the recent must-see Slumdog Millionaire, or for anyone who has ever wanted to glimpse beyond the surface of a film and understand how directors use various technical tricks and narratives to create emotional responses in an audience. I really enjoyed reading this book. As a film nut, I suspect I will dip in and out of it again and again! Well worth a look from either the casual Boyle fan, or those studying him. It is well written and very enjoyable, and opens his work up to a new level.